As someone who has owned a scientific calculator since school, I am very aware on how I don’t need to use most of what one can do any more – in fact, the simpler sums I need could often be done by my phone’s calculator app instead. However, the vestigial memories of trigonometry and matrices still in my mind from my Maths A-Level mean the need may come back, so I may as well be ready. The scientific calculator was invented by Hewlett-Packard in 1968, with the HP9100A, a cash register-sized machine with a TV screen, no integrated circuits, and a five thousand-dollar price tag. 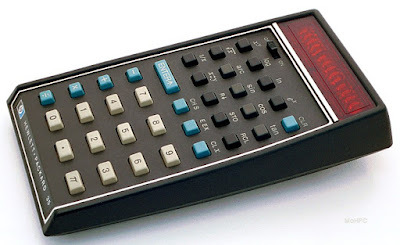 Four years later, the HP-35 was designed to co-founder Bill Hewlett’s brief to fit the 9100A into his shirt pocket, becoming the first scientific calculator as we know it. In 1976, a later pocket model, the HP-65, became the first such calculator in space, in case the guidance computer on the Apollo-Soyuz Test Project failed (it didn’t). With more programming ability than most will ever need, exploring the functions of a scientific calculator can produce some interesting results. On my model, I can move between decimal numerals (your usual 0-9, also known as base 10) and other counting systems. For example, 666, becomes 29A in hexadecimal (0-9 then A-F, base 16), and 1232 in octal (0-7, base 8) – therefore, we have the Number of the Beast, the House Number of the Beast, and the PIN Number of the Beast. 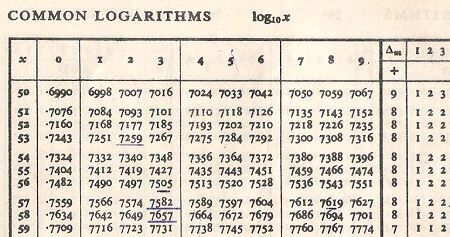 However, the most interesting function there is on my calculator, and the one that produces many of the numbers we are asked to observe in everyday life, is “log,” for logarithm. In the simplest terms, logarithms are used to make long numbers easier to handle, by creating a relationship between an exponent number, and the number that exponent needs to be to raise the power of a base number to the value you want. You can make one thousand by multiplying ten together three times (10 x 10 x 10 = 103 = 1000). 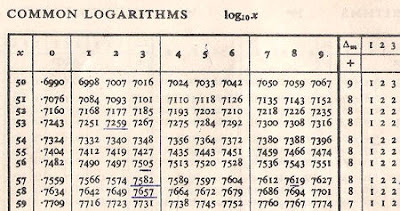 Taking 10 at its base, the logarithm of 10 is 3, because you needed to raise 10 three times (log10 1000 = 3) - likewise, the logarithm for one million would be 6, and 26 would be about 1.415. Using the “log” button on your calculator assumes base 10, the “common algorithm,” but base e (2.71828…), a pi-like constant in mathematics, is also used, denoted by the “ln” key on your calculator. However, the headline figure should always be the starting point for your understanding. You don’t necessarily need to know that a magnitude 2.0 hurricane is thirty-two times more powerful than one of magnitude 1.0, multiplying by that amount with each full number, but knowing this brings clarity to the pictures of destruction that accompany the figures. The same can also be applied to interest rates on bank accounts and credit cards, and other figures that may feel abstract, encouraging an easier relationship with numbers.